What are the health risks following a hurricane like Harvey and how do you avoid them ? Hurricane Harvey may be over, but in the aftermath of this violent storm various health and safety hazards linger. Among them are disease, contamination from industrial and household chemicals, contamination from leaking sewage, and injuries. 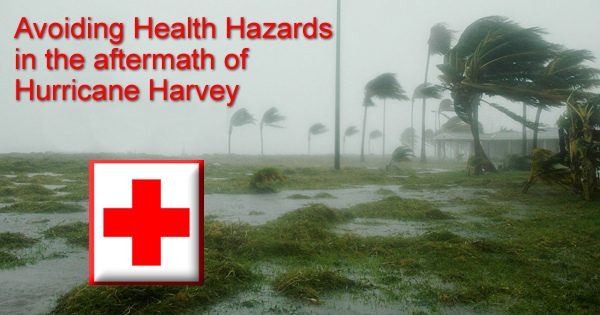 In the aftermath of a natural disaster like Hurricane Harvey there are a multitude of health hazards that you should be aware of and guard against. Electrocution, contamination from a number of sources, infection, mold and animal bites are just a few of the issues that residents may confront when returning to their homes. Other health threats following Harvey include air pollution, carbon monoxide, and mosquitos. Clean-up may take many months, so those affected by Hurricane Harvey, or any severe storm, should be aware of the possible dangers that exist and be prepared to handle them. Floodwaters carry bacteria that cause disease and pose risks of infection. E.coli, salmonella, and shigellosis are the most common diseases that result, causing diarrhea, fever, and cramps. To prevent infection, it is important to practice good personal hygiene by washing the hands frequently, especially before meals. Open wounds can become infected when exposed to floodwater that may be contaminated. Vibrios, bacteria that live in open water, can also infect the skin. Keep wounds as clean as possible and cover them with waterproof bandages. Various physical injuries can occur during a flood including drowning and bites from either insects or animals. Floodwaters displace animals, insects, and reptiles making unwanted contact far more likely. Rodents spread disease, contaminate food and destroy property. A person may be bitten by an insect or snake while wading through deep water and not be aware of it. Some of the signs of a snake bite are puncture marks, redness and swelling, nausea and vomiting, and disturbed vision. If you believe you or someone else has been bitten by a snake, keep still and calm and seek medical attention as soon as possible. Hazardous solvents and industrial chemicals may have been moved by flood waters from businesses and homes and released into the environment. Listen for announcements and alerts from the CDC and EPA regarding chemical safety and disposal issues in your area and follow instructions to evacuate if that becomes necessary. Wash skin and dispose of clothing that may have come into contact with a dangerous chemical. Important numbers to have on hand if you or someone you know has been poisoned are the National Poison Control Center (1-800-222-1222) and the Animal Poison Control Center (1-888-426-4435). There is some good news however, the Centers for Disease Control and Prevention states that floodwater does not increase the risk of tetanus, so tetanus vaccines are probably not necessary. Also, the greater volume of water washed away a large portion of the mosquito population, so West Nile disease is not a large concern at this time. Unfortunately, however, debris and standing water may increase mosquito issues in 2018. Open doors and windows for at least 30 minutes before you stay any length of time to let the house dry out. Wear protective equipment including rubber boots, gloves, and goggles during cleanup. Keep children and pets out. Ask a professional electrician to check the electrical system before turning the power on. Have the water and waste water system professionally inspected. Assume the house has been contaminated with mold and may also have sewage contamination. Remove and discard drywall and insulation that has been damaged including any material that is one foot higher than the floodwater line. Remove any items that cannot be washed and disinfected such as upholstered furniture, mattresses, toys, books, and paper products. Clean all hard surfaces thoroughly with hot water and laundry or dish detergent. Wash clothes in hot water and detergent at a laundromat until the water system has been evaluated. Dispose of household chemicals safely and be alert for leaking containers. Returning to normal after a hurricane or any natural disaster can be a long and arduous task. For help in the aftermath of Hurricane Harvey, the Centers for Disease Control and Prevention has deployed pharmacy supplies and set up shelters and medical stations in Baton Rouge, Houston and Dallas. They also offer assistance regarding mold abatement, industrial contamination mitigation and disease control. For more information, see www.cdc.gov/disasters.